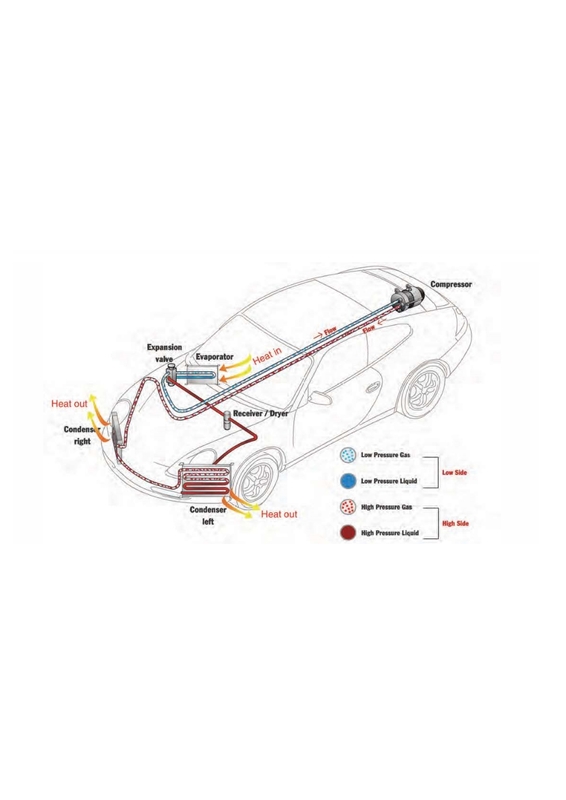 911uk.com - Porsche Forum : View topic - Guide to A/C system and faults . 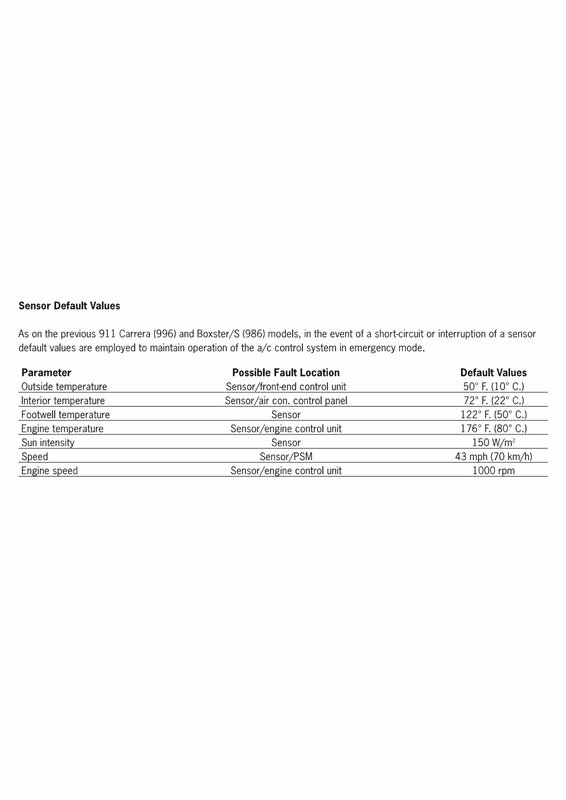 911uk.com Forum Index > 996 (1997 - 2005) > Guide to A/C system and faults . 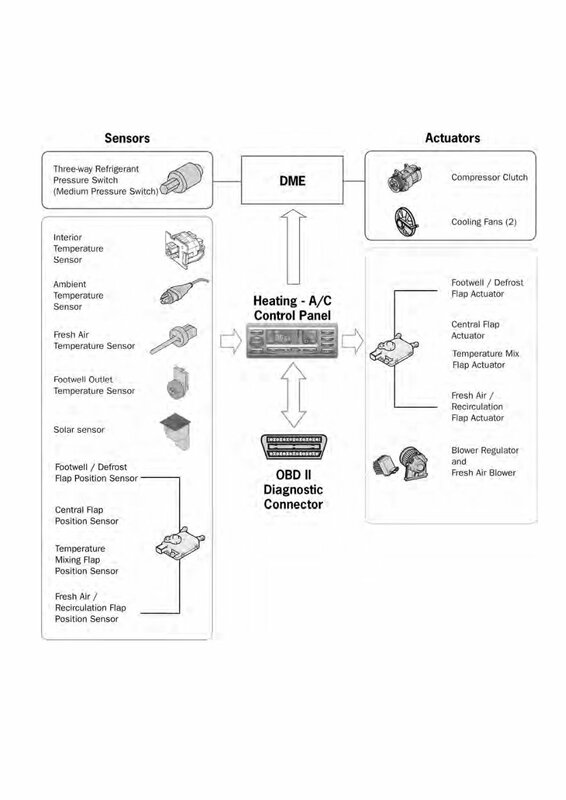 Posted: Sat Feb 23, 2019 7:43 pm Post subject: Guide to A/C system and faults . If your car is making a whining noise .. a rumble .. a noise like a worn bearing then try switching off the a/c . If the noise goes then the fault is probably low a/c gass . To test your car i find a temp of 19.5 with a fan speed of 3 .. give it a few mins on idle .. if you then hear a noise that stops when you switch off the a/c then its low gass . A/c gass .. which on these cars is R134a will have an annual loss of 10% per year .. you don't have a leak as such but its the normal escape of gas from the system. 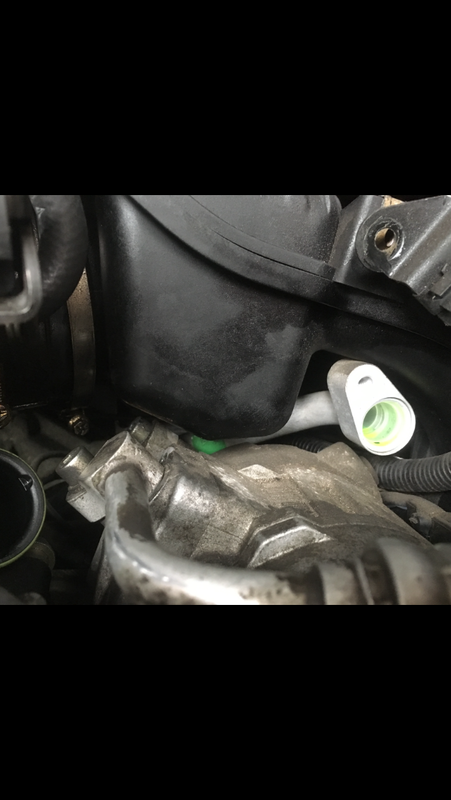 If your car hasn't been regassed in several years then you can see it is already low and you have probably gotten used to any noises . Leak areas .. obviously it can leak from any part of the system but the main 2 places are the front condensers and the o/s/r pipe connections .. just in front of the o/s/r wheel and under the panel . Condensers and you have to replace them .. see the image below for " damp spots " these are small leaks and will have an oily / dirty look to them .. if you are lucky you will see sighs of green .. that's the dye used to show leaks . Rear pipes and its corrosion thats causes leaks .. if you are lucky and can get the bolts out then clean the surfaces .. scotch brite , new seals and refit . Its not uncommon for these pipes to have pin hole corrosion at this joint though .. new seals wont help there .. your looking for a black spot on the pipe .. the more you dig at it the more white powder will come out .. that's ally corrosion . You also use this test on any a/c pipe in a bracket . The system holds 900 grams of R134a and 195 cm3 of oil .. ml . The oil coats the inside of all the components .. its like a mist and is used to lubricate the compressor . When degassing a system you will get some out but you will never get it all out hence we add oil as per the chart when items have been replaced . A vacuum to the system will make moisture boil .. this can then be sucked out .. oil doesn't boil in a vacuum . Fans will run at low speed when the a/c is turned on regardless of whether the system is working or not . Fan info can be found here .. If the car has been left open to atmosphere or has been empty for a while then its wise to replace the dryer along with what ever work you are doing . A/C rubber seals on the pipes .. these are designed to swell on contact with Pag oil .. always replace them when undertaking any work . oil used is pag oil 46 . When replacing a compressor .. the new one will come pre filled with the entire amount of oil for the system . You drain this out of the new compressor , you drain out the oil from the old compressor and measure it .. you then refill that amount of oil into the new compressor and fit it. Never .. ever just fit a new compressor out of the box .. it will hydro lock it and destroy it ... this is for every car .. not just Porsche . Images below show the system , the amount of oil per component that needs adding as a percentage of 195 cm3 , condenser leak and a few that i feel might be useful . 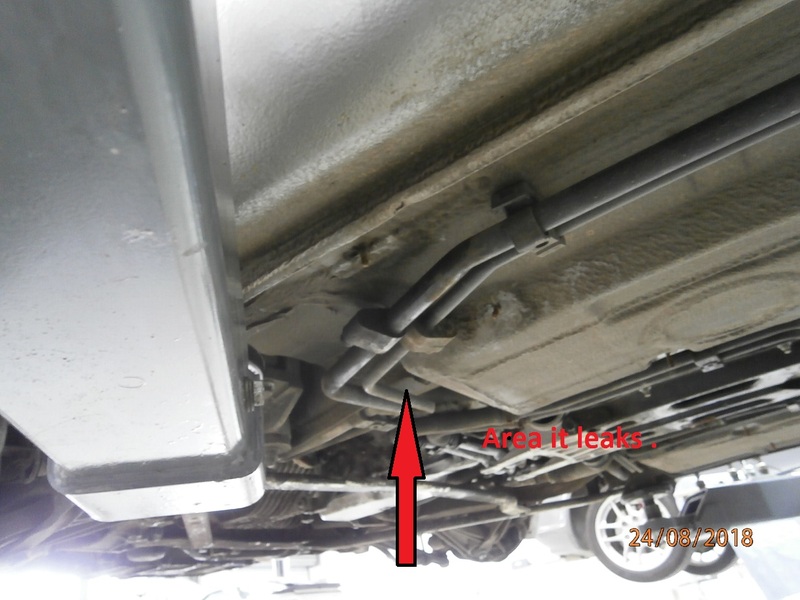 Image from Pelican and the black / red arrow shows the rear pipe connection although LHD . Gratitude to Pelican for their image and a well respected site that i think we all refer to . Brilliant, many thanks Iain. We really need a Wicki for things like this. Nice info, funny as my compressor develop loud noise I was thinking it is bearing but it is or should I say was compressor as my car is off road and yesterday before pulling compressor out I have spin wheel and no funny noise at all could be gas/oil refill back compressor when I was jacking a car? From your instruction it is look like I'm running low on oil/gas. How I can top up oil to compressor or this is something that shop will do? 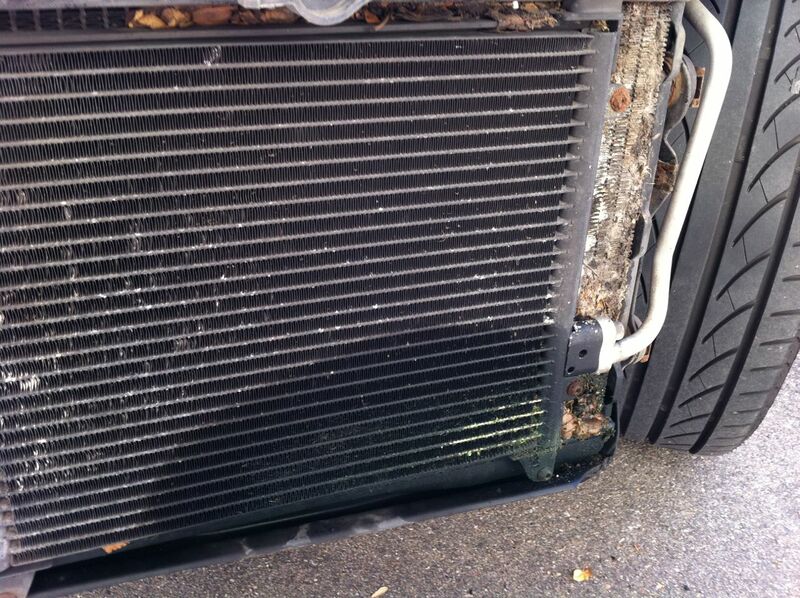 The system is evacuated, then the correct volume of oil and refrigerant added back in. Take it to your nearest car AC maintenance people. See the recent thread on Air con whine. There are special air con servicing machines that some garages have that do the whole job. Great write up demort. I’d say that’ll stop a few boys scratching their heads. A bit off topic but is there much to removing the air con all together? Is it simply remove the pump and get a smaller belt? Then just remove the pipes and condensers? Mine dosnt work and I’d never use it anyway. Not really .. i wouldn,t bother with the evaporator though .. dash out and not a huge weight saving. Compressor is the biggest weight saveing as the rest is ally . Dont forget .. the conensors take the stone damage .. if removeing them then fit some sort of grill as protection if you havent already . Ref noisy compressors then a video here ..
You will see its only noisy in operation and not when just idleing . I’ll start a new thread and see if anyone has been down that road. Ill just clarify things ..
you will get some oil out of the system on a regass ..
Its normally in the region of 5-10 mils ... with 195 on these cars being the total amount . You can not get all of the oil out .. this would involve removeing each component and letting them drain out for several hours .. again oil coats the inside of every component so removeing it is just not possible . We can get an idea of what oil is in the system .. if nothing comes out then it will logically be low .. we would add more oil . On a standard regass then i would add 10 mils oil and 10 mils of dye . Moisture will come out of a system with a vacuum .. oil wont . Saying the boss told me to do this is no excuse .. we are responsible for the save the planet stuff and we WILL be sent to prision for this .. i kid you not ... boss says regass .. i have to say no .. he says your sacked if not ... then im sacked .. thats how it goes . If i even suspect there is a leak then i am duty bound not to refill the system . Hi demort. Had a look at taking the pump out. I can’t for the life of me figure out how to get at the rear bolt, or even where it’s supposed to be. Any tips? Ps reservoir removed, pipe disconnected closest to the rear of the car, can’t just get at the front pipe with my Allen key as it’s tight and my key is just flexing in the small space that I have( it’s simply down to the angle that it’s been tightened, another few degrees and it’d be grand). Do I the front pipe off or am I supposed to go through the inlet manifold? I can't believe I missed this post. Mine started doing this whining noise last year, turn off AC and it stops. Been driving me mad. Thanks Demort! 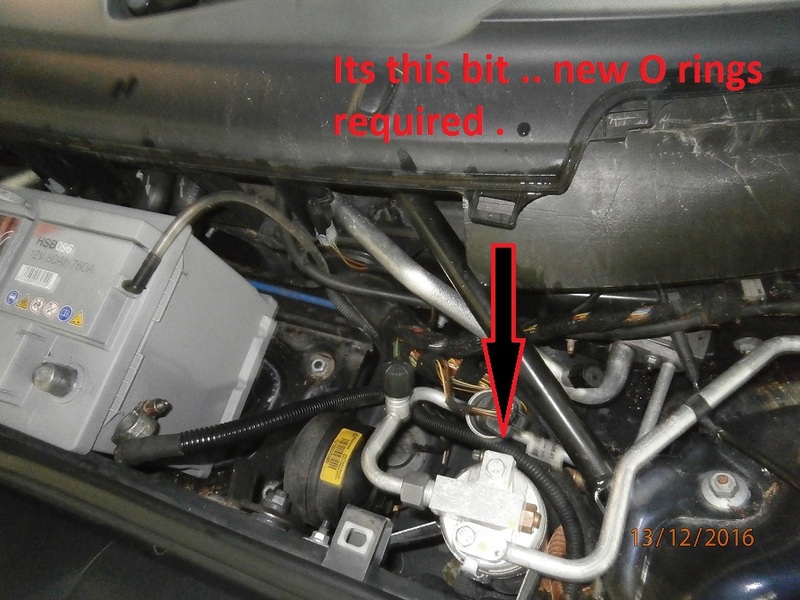 Its a bit fiddly shall we say .. the rear bolt is accessed down through the inlet manifold , i think you remove the engine bay temp sensor and get at it that way ... i'm afraid i just do it and dont think about which bits i remove . A wobbly type extension of about 4 inches and a 13mm socket .. when undone its a case of holding it up to get the compressor forward .. either fingers or a telescopic magnet . Under this bolt and with the compressor out you will see a spacer .. its just pushed into the hole .. don't loose this or knock it out as it has to be there when refitting . You don't undo the pipe at that allen key .. follow the pipe to the o/s/r and above the main wiring plugs .. disconnect it there . Check condensers for leaks and the rear pipes .. if nothing obvious then just get it regassed .. they do loose gas over time so its not always a leak . I have an issue with the AC in my car. It was re-gassed last year after i repaired a leak. It now gets down to temperature and is fine for a period of time (say 3hrs) but after then, it stops running cold and warms up. The next time i drive the car, its cold again. I've got a couple of hunches here ..
Down side .. the only chance you have of proving them is with a tester that can see the actual values of the sensors and you need to be looking at it when the fault is there .. in other words the a/c doesn't seem to be working . First one .. a/c pressure sensor , fitted next to the dryer .. im wondering if over a period of time its seeing an over pressure and shutting down .. may be a sensor fault or an actual fault due to a restriction .. cant say . Second would be an interior temp sensor is faulty .. if the sensor incorrectly reads then the a/c thinks the car is at 4 degrees for example when its actually 18 .. a/c will act on what the sensor says so will shut down a/c until it sees this sensor read higher than the specified temp . I think .. if the fault happens .. switch it to Low temp and see if the a/c kicks back in again .. if it doesn't i would lean towards my first answer .